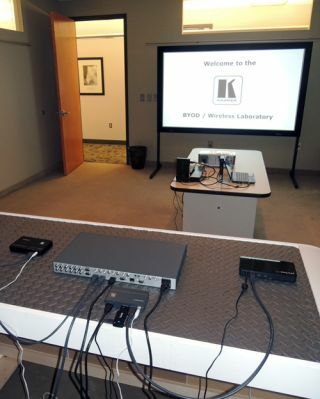 Kramer Electronics has opened its new BYOD / Wireless Lab at its corporate offices in Clinton, NJ. This new lab will allow Kramer engineers to test and compare wireless and wired connectivity products for tablets, notebooks, smartphones, and media players in a “real world” meeting room environment. BYOD’s (Bring Your Own Devices) are fast becoming the preferred portable/mobile computing model at home, at work, and at school. Although these devices can be connected through conventional digital interfaces (MHL, Lightning, micro HDMI), their small size and lightweight design has increased demand for wireless connectivity, using both 802.11-based and proprietary interfaces such as WHDI. Putman’s annual InfoComm class on wireless AV connectivity has featured live simultaneous demonstrations of a wireless Nook HD+ tablet prototype using WHDI, wireless Blu-ray and set-top box connectivity, and wireless notebook computers running PowerPoint’s and videos. Now, those demonstrations are part of a permanent setup in Kramer’s new test lab.